Sometimes online craft upcycling craft projects have some pretty spectacular but totally useless results. Sure- bottle caps can be made into art, but quite frankly most of the upcycled ideas on Pinterest for these type of activities have me wondering what the heck you would use the results for. This upcycle is practical, easy, and one I invented to do in ten minutes before getting ready for work (because at the moment I have multiple jobs and very minimal craft time). The produce bag you see above is the leg of an old pair of Ged’s shorts that were worn beyond repair. The require minimal skill and sewing time. I would have had two bags but I used the other leg for a craft project with some Neighbourhood kids earlier in the week (and now I’m peeved I didn’t think of this earlier). 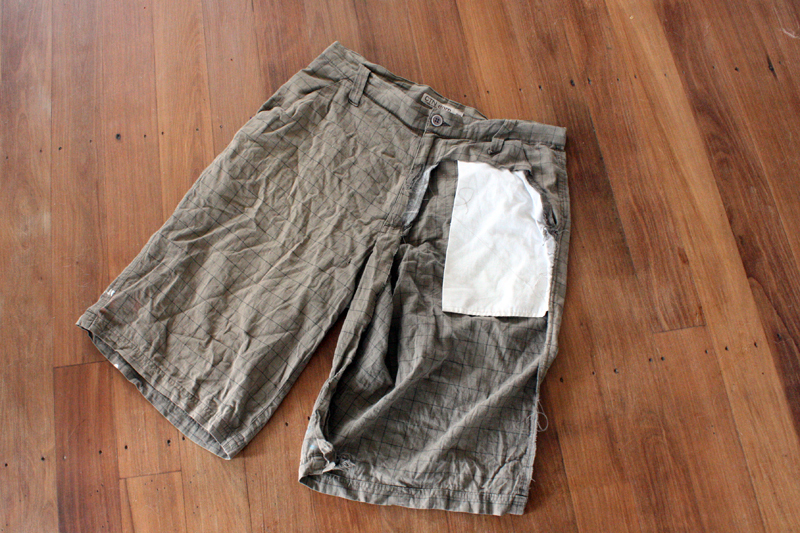 A pair of shorts or pants that you no longer use or wear (like the classy half-destroyed pair above). A sewing machine or some decent hand sewing skills. Cut the leg of the shorts or pants off. You will be using the cuff of the leg as the drawstring. Slice the cuff open with a sharp knife or your scissors along the leg seam (check the image above). Tie your jute to a needle or a safety pin and feed it through the cuff until it goes all the way around and back out the same hole you inserted it into. Knot the two ends of the jute together. You will now have a drawstring top. Your bag needs a bottom. This is where you will need a sewing machine (or some awesome hand sewing skills). Turn the pant leg inside out and fold the open end over twice and pin. The reason for this is that all the raw edges will be concealed and you won’t have to overlock or zig-zag stitch. Backstitch or tie the ends of your sewing together to secure. Pin along the seam and then sew it flat. Turn your bag the right way out and you are done! This project is super easy to do and would be a fun way to entertain kids over the holidays as the results would make nice book bags. I’m so happy to have made these shorts useful again and I actually think they make a much nicer produce bag than they did shorts (can’t say they were my fave shorts that Ged owned.. just some random ones we thrifted about six years ago). 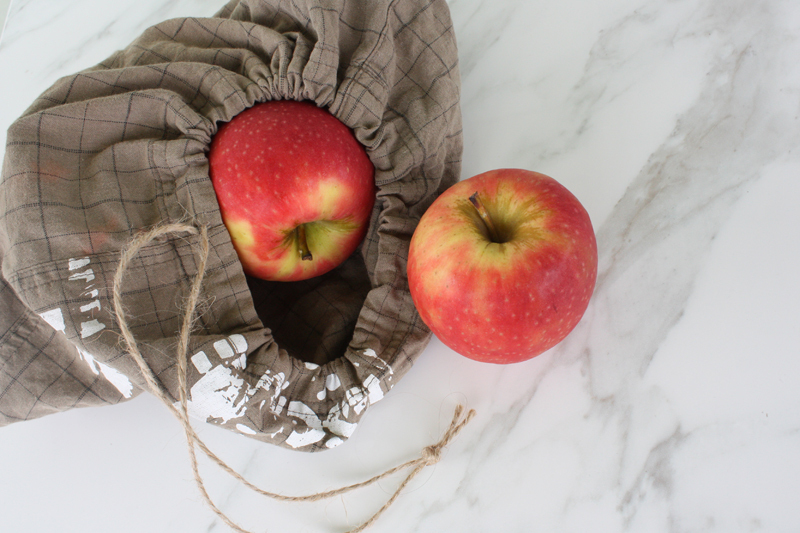 What would you use your produce bag for? Got any variations on the design? Want to share the results? Fire away in the comments section.